Thus far, CTMQ has been very a rewarding experience for me. There are those rare times that I bumble off to somewhere with unfairly low expectations and come away wondering why I had my initial cynical thoughts. 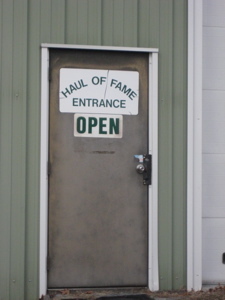 Never has that feeling been more evident than my experience over at the Haul of Fame Trucking Museum in Canterbury. First things first… “Haul of Fame?” Now why in the world would I, one who has never been afraid of a bad pun, have doubted this place? Oh yeah, that’s right… because its only web presence at the time of this writing was a few articles about the state’s successful lawsuit against the property. Attorney General Richard Blumenthal announced today that he has filed a wide-ranging lawsuit against the owners of a controversial landfill and incinerator in Canterbury, alleging that the owners improperly operated the landfill by accepting too much garbage, allowing wastes to seep into groundwater and operating an incinerator without a permit. 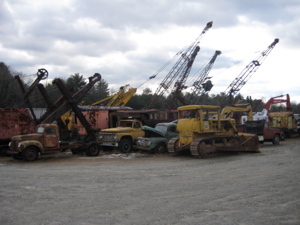 The operators of this landfill have a dismal record of repeated environmental illegality,” Blumenthal said. “Not only have they jeopardized valuable natural resources in our state, but they have fouled the air for their neighbors by failing to take the steps that are necessary when operating a landfill. So you see, the prospect of visiting a museum in such a setting – a museum about trucks which neither I nor my partner for the day EdHill know a whit about – wasn’t exactly awe-inspiring. The drive to it didn’t help; Canterbury is already in more-or-less rural Eastern Connecticut (aka, the “Quiet Corner”) and the Haul of Fame/Superfund site is very deep into the bush, as they say. Ed gets squirmy any time we venture beyond his suburban comfort zone, but before he could yell, “Deliverance!” we arrived at the chain link gate and began our adventure. 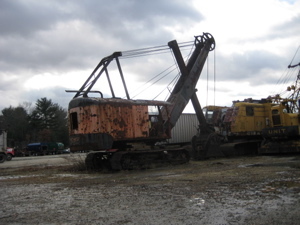 We drove past a graveyard of rusted and hulking shells of old dumptrucks and cranes. There were rows upon rows of old rotted buses. A short diversion to the wrong building (go to the right once on the property) and before us spread rows of trucks, cars, cranes, and piles of rusted scrap metal as far as we could see. I had the fleeting thought that that was the “museum.” But then we happened upon the most spartan entrance and sign I’ve seen yet and we entered. It was dark and it was cold – but it was great! Ed and I weren’t really sure what to do, so we slowly crept over to some old cars in pristine condition. [Note: I know nothing about cars or engines or trucks or any of the stuff housed at this museum. So please, bear with my ignorance for the rest of this review.] There are very few interpretive signs here at the Haul of Fame, but they wouldn’t have helped much anyways, because gear ratios and axle widths mean nothing to me. Just as Ed and I were formulating a plan of attack, out came our tour guide! I never caught his name, but he was the best. Riding in his Rascal (or possibly a Lark), he greeted us warmly after noting our city slickerishness. And so began one of the most fascinating 90 minutes of CTMQ’s experience. Our guide immediately launched into the museum’s history and the troubles with the state that the owners have had. According to him, the whole lawsuit mentioned above was a bunch of hooey and that the adjacent landfill never had a violation in 45 years of operation. How DARE the state cite the owners and ruin their lives! Hearing him talk, we came to believe their side of the story. Oh yeah, he was that good. The docent’s stories had a few landfill sized holes in it (ex: “We have no Internet presence or advertising because if some little kid has a truck fall on him, we’d be sued. Ed mentioned “insurance” but didn’t press.) but we weren’t way out there in Canterbury to argue over the merits of our Attorney General, how much clean fill it takes to decontaminate land fill, or “friends” in New Jersey who may or may not have screwed the Yaworksi’s over. We were there to check out some trucks – and that’s just what we did. 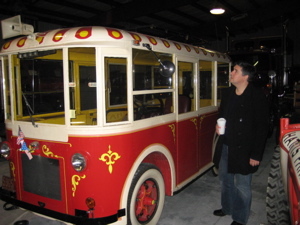 One of our favorite items was the 1929 little bus thing. Originally with a V4, it has been retrofitted with a V12 engine which is only interesting because the brake system of the thing certainly cannot handle that kind of power, making it rather a challenge to drive. That’s another thing – every vehicle in here was driven in and started a couple times a year. 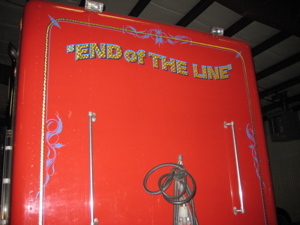 There is a Mack Truck cab in there with “End of the Line” in gold leaf on it. Check it out – this is the very last 1993 Mack of this style ever to roll off the production line. For some reason that interested me – as did the story about the volunteer from somewhere up in Massachusetts who did a ton of gold leaf work on some of the trucks. It looked to me as if the writing was done by machine. We were told he’s the best in the world and works with both hands at the same time; to see him work is apparently mesmerizing. The stories continued; one of the least impressive looking trucks of the fleet was a 1942 Wellington hauler. This limited production truck was made to specifically haul 75 ton cannons up and down the East Coast during WWII. There are very few left in the world and this truck is worth seven figures or something. We checked out a few more and were then ushered to the back room. On the way we passed through a nice (random) kitchen area and meeting room. The back room was a bit more “homey” with wood beams and large paned floor-to-ceiling windows. When this place was at its peak, I’d imagine it would have taken a whole day to fully check it out. Almost every new truck came with a fascinating story from our guide. Here Ed and I were, two guys who have never done anything “trucky” in our lives save for a few U-Haul moves, doting on every word of our fearless guide. Ed and I marveled over this thing. Just as we picked our jaws up off the ground, it was time to learn of another gentleman’s incredibly hobby. He spends his days making working models of machine parts. Sound dumb? 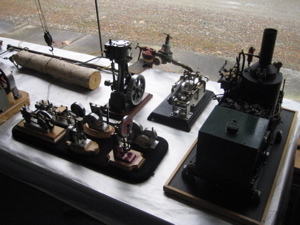 It’s not; these things (and there were 3 or 4 tables full of them) are perfectly replicated steam engines of all different sorts. They all work and were machined in the guy’s garage. They can be seen running over at the Museum Annex in Plainfield on Mondays, if interested. Oh yeah – the hobbyist is 82. Although our stay at the Haul of Fame was WAY over the budgeted time, we allowed for one more story; a heartwarming tale about the 1936 dump truck seen just above. The Yaworski kids restored it for their father’s 90th (or something) birthday and spent years doing so. 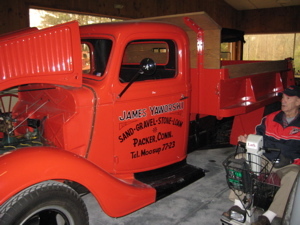 You see, this was the original (model) truck Mr. Yaworski started his hauling business with way back in the days – a $915 investment at the time. He was moved to tears upon receipt and was hesitant to drive the floor shifter, non-power steering, non-power brakes truck. But he did – and according to our docent, didn’t grind a single gear; a feat to be sure. We said goodbye to the gentleman on the Lark (or Rascal) and exited back through the dark and chilly cavern housing the first room we viewed. The chill and poor lighting left us feeling sad (they have very little money for heat/light) that mismanagement of a landfill has hurt a true CTMQ Hidden Gem. And this place absolutely is – geographically and otherwise. So hurry up and get out the backroads of Canterbury to see some of this stuff before it’s all gone! And that is not an idle threat, sadly. This is my favorite (non-Damian) story. A friend of mine at UConn was from Canterbury. She talked about how her friend owned a Christmas tree farm, never anything about a landfill that I can remember. Is that really the quiet corner, I thought that was farther north near Putnam? This is sort of desolate middle eastern part of the rectangle, Connecticut being the rectangle. Having a similar impression about the place, mostly because of its location (the dump) and the junk outside you accurately described, I have wondered what was really in there, now I know I might make a stop when I get the chance. did you happen to drive across the bridge over the river? its a nice scenic view and in sharp contrast to the fact there is a dump just yards away, oh and the superfund site just down the road… The last report I remember said no contaminates have reached into the river , but I still wouldn’t eat the fish there! It would have been a really great story if you had only stuck to the museum and it’s trucks, and not published the politics and FALSE information provided to you by your “guide”. First off, when you do unethical things, (like polluting, mis-managing, and squandering money) there are usually concequences. Also, you tend to call attention to yourself with the “authorities”, and get yourself into a huge mess of trouble. Second, when you borrow a huge amount of money from a “so called friend” to help bail you out, it’s not called a “partnership”, it’s called a LOAN! Loans have terms (like you are expected to pay them back), and usually have collateral (sometimes, trucks). They usually have a time frame in which they are supposed to be payed back. Sometimes, “so called friends” will extend that time frame. When that time frame doubles or even triples with no attempt to make good, it’s usually time to do something about it. I happen to know that the “collateral trucks” were hand picked by the museum’s owner, and the price was set for each piece by him as well. Do you really think he would let 7.5 million dollars worth of trucks go out the door to satisfy a “a mere few hunred thousand dollars” loan? 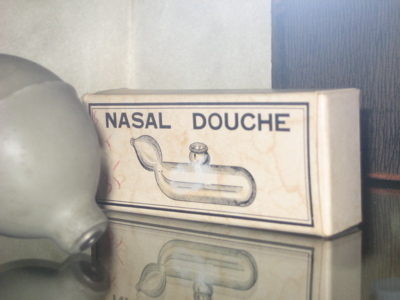 Doesn’t something smell wrong to you there? That is absolutely ridiculous! This “so called friend” will be lucky if he re-coops a small fraction of his money in rusted out “junkers”. I think it is pretty unproffessional to publish that someone is a “jerk” or a “shyster”, only based on hearsay, and one side of the story coming from a third party. No, I am not the “so called friend”, and he has no idea I am even writting this. I’m just an innocent bystander who happens to know both parties, and happens to have witnessed the truth first hand. The commenter is correct and I have edited the story to clarify our guide’s words versus my own. I have removed the words “jerk” and “shyster,” as I happen to probably most likely agree with Mr. Anonymous. The Yaworki’s have a documented history of pitiful environmental stewardship and as I did originally write, the stories about the lawsuits and loans to “so-called friends” did not add up. CTMQ apologizes for not making this clear. CTMQ does not, however, apologize for being “unprofessional,” as I am unabashedly so. I too apologize for being so harsh, and for my use of the word “unproffessional”. You are obviously a stand up guy. I moved to Rhode Island in 2003 and left 2 years ago to drive truck. I only know about the place because I just drove by it today and decided to google the name. It sounds like a place I would love to visit except that there usually isn’t enough room to turn an 18-wheeler around at most places like that and there DEFINITELY isn’t enough room to part it along side the road. Six Shooter – I assure you, there is PLENTY of room once on the property, to turn around your truck. Heck, there’s enough room to turn around one of those things that carry the Space Shuttle. I know it doesn’t look like it from that tiny road, but the property is HUGE. 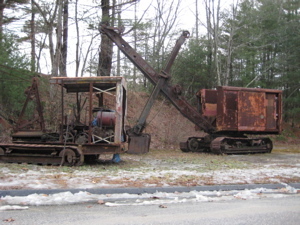 Anybody that is into old truck and heavy equipment should check this place out. I was up there a couple times, as recent as 01/16/10 and it is a awesome collection of history. I will go again when its warmer. Used to go to the dump years ago and on several occasions I stopped at the museum, those boys had trucks you could only imagine, 1937 Sterling w/original paint (the bottle jack still on the frame), one of the first “jitterbugs” Mack built, one of the first “sleeper cabs” made, a double trunion Mack DM capable of hauling 350K in NYC building moves, the building was chock a block full of history. In fact I used up over 2 hours of video tape there. Jim and Dennis had no sons to pass the business onto and I guess their daughters didn’t want anything to do with it, at least that’s how the story went back in 94′. In addition to the last Superliner Mack made, the brothers also got the last 2 V-8’S Mack manufactured. And yes a portion of the property is rented to a waste company and the owner does diesel repair on the front of building. when entering property cross the front of first building and follow around to building on right and drive around to backside. 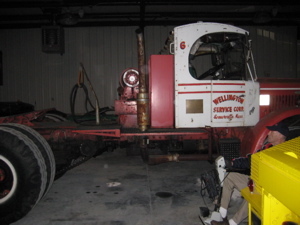 I have a very long history with what the site is caLLing the WELLINGTON HAULER, HAD OVER 17 YEARS fixing that Mack chain drive with the cummins engine and NICK welded on the clutch pedal long before it was donated to the museum, I very very sad that it is not being seen by more people as it was intended when Mr. Chet Fox donated the truck. Truck should have stayed in the Boston area. 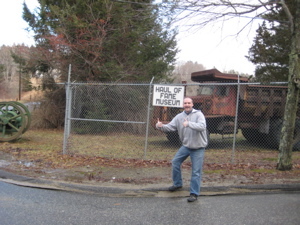 Now I live in Waterford CT but grew up in Plainfield and visited the Haul of Fame with my mom when she was alive. Would love to take my grandchildren there during the summer of 2015 if it is still open for tours. 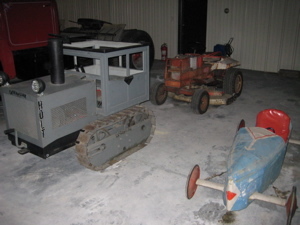 Have fond memories of this amazing collection of special trucks and other equipment. Wow! photographs posted looks amazing even I am feeling like visiting Haul of Fame now, as I am a huge fan of trucks and always feel like driving such big hauling trucks. I have shipped many of my vehicles hiring auto transport company’s (http://www.wewilltransportit.com/) hauling trucks but never got a chance to drive it. I ran the Madison/Guilford transfer station in the early eighties. I got to know and became friends with Jim and met Dennis. Jim invited me to visit the collection with him but I never made it. I would still like to see the trucks. The fellow writing the article should have found someone that would have let him try driving one of the old trucks. 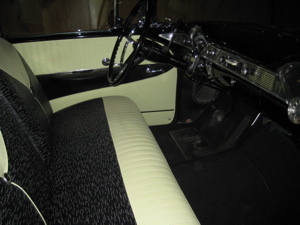 The first truck I drove after getting out of the service was a 1958 Autocar. 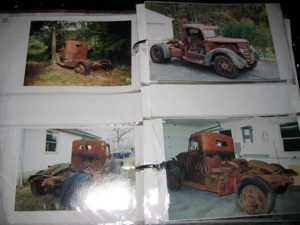 It was a ten wheel dump truck with a 16 yard dump body, 190 horsepower Cummins engine and a fifteen speed transmission. No power steering. It was a joy. The Canterbury, “Haul of Fame,” museum is a private collection, yes, but was created for public display at no cost to viewers. What’s invisible is the high overhead and zero profits that sustain this museum. Donations are accepted. The finished trucks are mostly stored inside the museum building. There are many trucks parked outside and are not just wrecks. 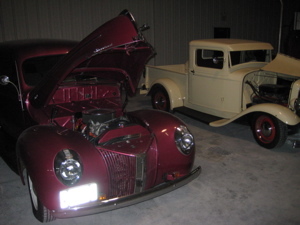 Those outside trucks have been used for parts and for full restoration, whenever someone is interested and talented enough to take them on. Most of those outside trucks have been saved from salvage, and therefore preserved in a historic sense. Many of the outside trucks have, in recent years, been towed away for restoration. Those remaining provide an interesting look at the history of trucking. An important part of this museum is, not only the preservation of trucking in America, but preservation of the company names that participated in building America. Denis is keen on retaining the company names that were originally lettered on any trucks, whenever possible. The feeling is, the company names are as important to the history as the trucks themselves. Yes, the museum is limited in hours and limited on buildings to house the trucks. The museum used to be open six days a week. A number of the original curators, who volunteered their services, have passed on. Few remain who offer their services to the museum, free of charge. That does not preclude the enthusiasm of those who support the museum today. 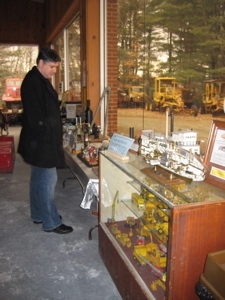 The museum is open every Wednesday, from 8 a.m. until 3 p.m. Denis will, whenever possible, open the museum upon request for a group with an interest in seeing the trucks. 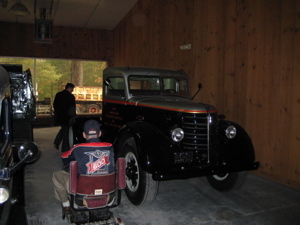 The museum also hosts car and truck club events, utilizing their event room inside the museum. Those events are hosted, as well, by volunteers, and are often catered. The Haul of Fame, in recent years, has undergone a lot of change. The exhibits, of recent, are ever increasing. The back of the museum building is no longer a work place, but houses many “new” exhibits. You can call the museum, on Wednesday’s at 860-546-6733. The Canterbury, “Haul of Fame,” is well worth the time invested to visit.